Both defenses stink, but that’s stating the obvious. According to Pro Football Focus, they are both in the bottom four in the NFL. Tampa was +2 in turnovers, New Orleans was +197 in total yards and +9 in penalties. I thought most (if not all) the questionable calls went against Tampa, and while the Buccaneers did some things to hurt themselves, they were the better team in this game and were robbed in a few situations. This was a bizarre game all around. Let’s get into the specifics. Mike Glennon – Glennon has impressed me through two weeks. He hasn’t been amazing, but most of his throws have been on target, or his misses have been to the proper side. His one INT was on a deep one-on-one throw down the sideline that should have been PI on the defender. Many guys picked up the slack for Mike Evans’ absence. Baltimore’s pass defense is weak, and while he’s not a great play, I wouldn’t mind rolling Glennon out in a couple GPPs if you’re making a ton of lineups. Doug Martin/Bobby Rainey – Martin is clearly the No. 1 back and is showing some of his explosiveness that we saw in 2012, but Rainey is still getting some action and did get the TD in this game. Martin had a huge run and a catch called back for penalties, one legit and one a bad call. The Buccaneers OL struggled some in run blocking, but it wasn’t atrocious. They were much better on stretch plays than between the tackles. You shouldn’t use Martin against the Ravens, but don’t just instantly say no to this guy because of common perception. Vincent Jackson – Classic Vincent – 8 catches for 144 yards. Unfortunately, no TDs hurt him for a huge fantasy day. Still, Jackson now appears to be 100 percent, and Glennon threw his way 12 times. Consider him a legit fantasy option while Evans is out. Louis Murphy – Murphy was a little disappointing since he was a good sneaky play. He only caught three of his seven targets. One should have been a defensive penalty, one should have been caught and the other two were misfires or throwaways in his direction. Murphy is still the No. 2 receiver with Evans out, and he could be used in some GPPs this week. Patrick Murray – Drilled his one FG from 55 yards. Murray is now 4-of-5 on the year and his miss was blocked when the blocking broke down. Murray has a huge and accurate leg. Buccaneers DST – This unit is around bottom-five in the league. This front four has gotten a solid pass rush all year though. That’s about it. Oddly enough, this is actually a time you could try the Buccaneers in a GPP against the Ravens. Baltimore’s OL is starting to struggle in pass protection, the game is a low O.U., Tampa is only a 3-point underdog and at home. I’m kind of stretching here though. Drew Brees – So, here’s what people want to know – what’s wrong with Drew Brees? It’s a combination of things. The Saints are running the ball more and using more screens. Why? Their OL is struggling in pass protection and doing much better in run blocking. I don’t know why this is exactly happening, but it’s true, and Pro Football Focus agrees. Every QB, especially non-mobile ones, always struggle when their OLs aren’t performing as well (just ask Tom Brady about the first few weeks). However, Brees has also regressed so far. His accuracy hasn’t been the same. An obvious example: tie game, 4th quarter, 24 seconds left, Saints have the ball and two timeouts at midfield, Brees has Robert Meachem wide open on a straight vertical for the TD, and he simpley underthrows him and it’s intercepted. Overtime. Sure, that’s a pressure situation, but he doesn’t miss throws like that, and he’s missing some simple throws at times too. Fantasy wise though, the Saints defense stinks, and when they are playing from behind, they love to throw it a ton. I like Brees a lot more when New Orleans is an underdog. Khiry Robinson/Pierre Thomas/Travaris Cadet – Khiry Robinson got 21 carries. No other player got more than four. Robinson finshed with 89 yards and a TD. He looks like a solid RB all around and has a lot more strength than you would think on first glance. Thomas caught eight balls for a team-high 77 yards. Most of these came on designed plays on screens with a couple dumpoffs. Thomas found the end zone once through the air and another on a fantastic run where broke a tackle in space (seriously). Cadet got into the end zone on a dumpoff as well. With a bye week and Mark Ingram possibly coming back in Week 7, this is a wait-and-see situation. Brandon Cooks – If you’ve read my analysis on Cooks before, you know I like him a lot. This game only enhanced that stance. To be fair, Cooks did benefit with Graham getting hurt, but Cooks got five of his 11 targets while Graham was in the game until midway through the second quarter. Cooks finished with nine catches for 56 yards and also got two carries for 15 yards. The one downside to Cooks is that he is running a lot more shorter and mid-range routes, while Marques Colston, Kenny Stills and Meachem are flying downfield. With so many weapons, it’s tough for him to get a dozen receptions. However, Cooks is very consistent, gets a lot of looks in the red zone, is used in special teams, is close to breaking a couple huge runs and has solid PPR value. Jimmy Graham – Suffered a shoulder injury in the second quarter. He didn’t return. I have been often fading Graham this year, because I don’t like his upside as much due to all the weapons (Cooks too), the Saints’ OL pass-protection struggles and the team wanting to run more. Obviously he got hurt and could have had a big game. I still see him more as a $7K player than an $8k guy. Although, the other guys at Daily Fantasy Winners disagree with me on this. Other Saints WRs/TEs – No one has really stepped up as the third guy. Meachem and Stills are the deep threats on the outside. Colston runs up the seam. Shayne Graham – Connected on all three of his field goals. It had been somewhat of a shaky start to the year for Graham, but making all three of his kicks (44 yards was his longest) was a positive sign for him. Saints DST – The Saints have now been 10-point favorites at home against the Vikings and Buccaneers. Neither time have they put up a great performance. This defense is just weak all around, and the injuries are piling up. Despite the one-score game, the Colts absolutely dominated this game. They had the ball for 39 minutes, the Ravens turned it over three times (all in Indy territory), Indy dominated field position all day and outgained the Ravens 422-287. So, why the score? The Colts turned it over four times (all in Baltimore territory), they had a terrible spot by the official on a 4th-and-1, the center screwed up the snap on a 3rd-and-1 and the refs missed two very obvious PI’s that should have been on Baltimore in the end zone (sorry, I’ve been bashing officials this last week in both college and NFL a bit). You could make the argument that Indy didn’t deserve to win by more than one score because of this, but Indy was simply better in nearly every area of the game. Oh, and these two teams combined for 3-of-8 scores in the red zone. Joe Flacco – When Flacco doesn’t get protection, he’s a mediocre QB, and that’s what he was. He took four sacks, was under pressure for most of the day and threw an atrocious INT after he was given a questionable pass interference call to extend the drive. He also missed a handful of open receivers. Considering the Colts’ weak pass D and that this was the first game they were without LaRon Landry, this was a fairly weak performance. Usually I’m not this critical in general, but Flacco was not good in this game, and he continues to particularly and significantly struggle on the road. Justin Forsett/Bernard Pierce/Lorenzo Taliaferro – This is going to sound really generic, but it’s the truth. All three of these guys are being used equally at this point, and I see no back getting a clear edge anytime soon. John Harbaugh is about having fresh legs in the backfield and not overworking anyone. Hard to use Baltimore back for the time being. Steve Smith – We all knew Smith was going to have to come back down to Earth at some point, especially after that performance against Carolina. 5 catches for 34 yards is probably what we expected from him preseason. Smith was only targeted seven times (tied for 3rd on the team) and made the most of his opportunities. Although, I think we can expect better from him against Tampa. Torrey Smith – It was another dud for Torrey Smith, who caught only three of his eight targets. I’ve watched every Ravens game, and this is seriously just unlucky. Flacco missed Smith wide open three times, one was a nice defensive play by the defender and another was just a throwaway in his direction. Coming into this game, Smith led the NFL in pass intereferences drawn too. Smith’s luck will turn around at some point, and I would use him in some GPPs against Tampa. Owen Daniels – Daniels should be your basic solid performer going forward at TE. In the two games without Dennis Pitta, Daniels has 9 catches on 23 targets for 113 yards (5 catches for 70 yards in this one). Daniels catches everything his way, but he isn’t the main target either. Since he will be an ideal target for Flacco in the red zone on bootlegs, such as what happened twice against the Steelers, playing Daniels as a really cheap option in GPPs is fine. His upside in general is limited though. Justin Tucker – I probably praise kickers too much, but Tucker might be my vote for best kicker in the NFL. He’s now 79-of-87 in his career, and he was another 2-for-2 in this game that included a 52-yarder right down the middle. Ravens DST – The Ravens’ pass defense has really struggled this year, so they had a lot of six-men boxes to get some secondary players on the outside. This is why you see Indianapolis having success on the ground in this game to go with another brilliant day from Andrew Luck. Had it not been for the four turnovers, two of which were just fairly unlucky, the Ravens defense would have had a miserable day both score and fantasy wise. Andrew Luck – Luck is just dominating every team that comes his way. Between accuracy, passing distribution and scrambling/running ability, Luck is crushing. However, he’s faced a lot of the weaker pass defenses in the NFL so far. Still, that’s not much of a concern considering that the pass game is a much bigger strength. His two INTs? One was a ball batted at the line of scrimmage that went into the air and into the arms of Haloti Ngata (this was a heck of a defensive play) and the other was a good pass to Ahmad Bradshaw on sideline and near the goal line, but he was hit as he tried to catch ball, it bounced off his chest and went into the arms of a C.J. Mosley. Luck will continue to be expensive though in daily fantasy. Against Houston on a Thursday night on the road, I don’t love the matchup, but I don’t hate it either. I think the road team Thursday night fails is overrated right now. The Packers were -9.5 vs the Vikings (Christian Ponder at QB) and the Falcons were -6.5 against the Buccaneers (and we know how much better Atlanta is at home). There were several games last year when the road team performed well, plus the Giants dominated at Washington in Week 4 on Thursday. So, Luck might be lowly used in Thursday formats considering people are buying into a myth and that he’s expensive. But, he is Luck, and he’s on a roll. A fine play all around. Trent Richardson/Ahmad Bradshaw – With the Ravens focusing on stopping the pass and playing a lot of secondary players, the Colts ran the ball for 117 yards on 30 carries. Both Richardson and Bradshaw averaged over four yards a carry with Luck taking a long sack due to a bad snap and a couple short scrambles. Here’s the deal with these guys though. The offensive line in run blocking absolutely stinks. It’s stunk for a while. Richardson has more speed, and he needs a good OL to be amazing since his vision isn’t great (underrated and important aspect) and he doesn’t get a lot of yards after contact (although he’s improving). 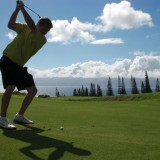 Bradshaw is better at going low to the ground and making more our of nothing. This is why you see Bradshaw’s YPC always a bit higher consistently. What is of note is that usually Richardson gets more carries, but Bradshaw actually had 15 touches to Richardson’s nine in this game. However, Bradshaw committed an atrocious fumble at the end of the game in Baltimore territory under 2 minutes remaining that gave the Ravens life to tie the game. Both guys also caught four balls in the passing game. Houston’s rush defense isn’t good right now, and if you’re going to use someone, I’d go with Bradshaw from the simple fact he had more carries this last game and he’s usually involved more in the passing game. His upside is probably higher. But there’s no way Richardson’s workload will decrease more than this. They need to be complimenting each other while this OL struggles. 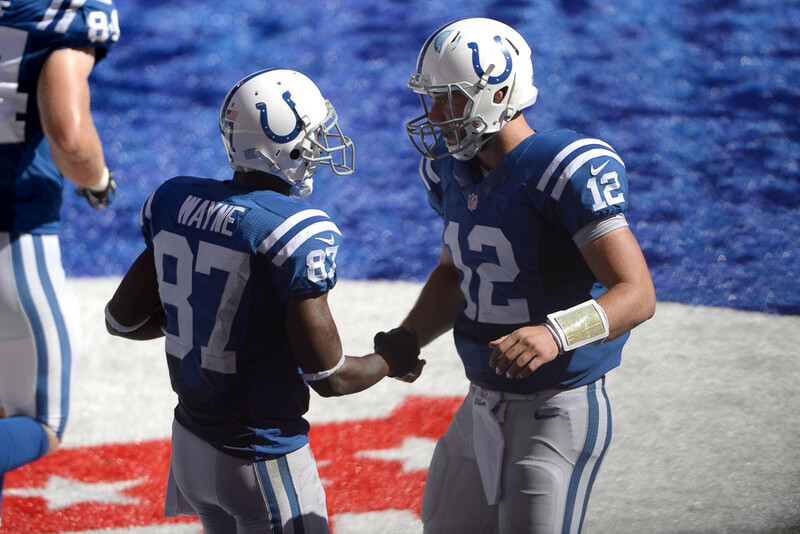 Reggie Wayne – This guy just brings it every week – another seven catches for 77 yards. He should have had a TD, but the ref missed a terrible PI who pushed him from behind as he went toward the ball. He’s still a fantastic overall receiver who does everything well. T.Y. Hilton – Hilton is someone I was wrong about preseason. I thought he would be somewhat disappointing since Hilton had a lot of his great games when Wayne was out last year and everyone remembers his crazy playoff game against Kansas City (Dwayne Allen also missed time). But Hilton is evolving into another great receiver. With his speed and deep play ability, he has more upside than Wayne, while he’s not quite as good of a route runner without Wayne’s outstanding hands (that’s more of a credit to Wayne than to discount Hilton). It’s really hard to pick one guy over the other unless there’s one great corner on the opponent and you know who he’s going to cover. I admit I’m really nitpicking here, but if the Colts are a big favorite, I would go with Wayne, since he’s more of a go-to guy, possession receiver and Indy would want to run time off the clock. If the Colts are underdogs, I would choose Hilton. Hilton has the deep-play ability and Indy will more want to take shots (see Chiefs playoff game). Adam Vinatieri – Punched through his one 25-yarder. Colts DST – This unit has looked good recently, but don’t let that fool you. At Jacksonville, Tennessee, Baltimore were the last three opponents. Remember how poor they looked against Denver and blew the game against Philadelphia. The truth, as it often does in sports, lies somewhere in the middle. As only a slight road favorite, don’t use them against Houston.